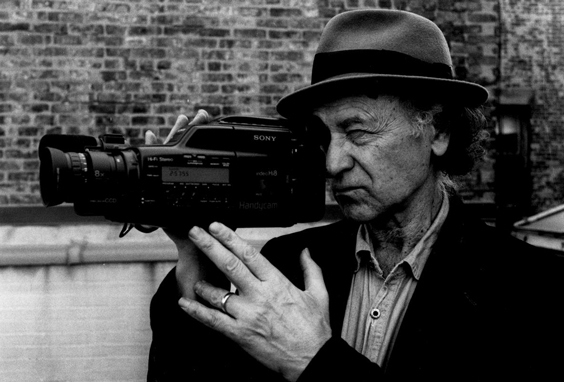 Jonas Mekas. Photo: the Paris Review. Jonas Mekas, the Lithuanian-born American filmmaker, poet, and archivist whose contributions to American avant-garde cinema shaped the field and perhaps ensured its future, has died at age ninety-six. His output, which spans seven decades and even more films, along with innumerable mentorships and over twenty books of prose and verse, has inspired generations of filmmakers, writers, and audiences. His films and archival material have been exhibited widely throughout the world, including at Documenta 11, the Fifty-First Venice Biennale, the Whitney Museum of American Art, and MoMA PS1. His numerous awards include a Commandeur de l’Ordre des Arts et Lettres from the French Ministry of Culture, and his work was the subject of a survey at London’s Serpentine Gallery in 2012. Mekas was born in 1922 in the farming village of Semeniškiai. In 1944, Mekas and his brother Adolfas were taken by Nazis to a German labor camp. After the war, Mekas studied philosophy at the University of Mainz, and in 1949, the United Nations resettled him and Adolfas in Williamsburg, Brooklyn. There, Mekas began preserving snippets of his daily life with a handheld 16-mm Bolex camera. The practice would lead to more than twenty films, including the acclaimed Diaries, Notes, and Sketches (1969; also known as Walden) and Lost, Lost, Lost (1976). Mekas repeatedly turned to his own life in his work, which often forgoes linear narrative for lyrical, diaristic meditations on memory and history. His early life was chronicled in the 1991 memoir I Had Nowhere to Go, which was reprinted in 2017 by Spector Books. In 1954 Mekas founded Film Culture magazine with his brother, and four years later he began a film column at the Village Voice, “Movie Journal,” where he championed what he dubbed the “New American Cinema.” In the early 1960s, Mekas established the Film-Makers’ Cooperative and Film-Makers’ Cinematheque. The latter is now Anthology Film Archives, whose collection hosts an unparalleled archive of avant-garde cinema. “It is largely through his efforts to create an infrastructure for avant-garde film that a small, economically disadvantaged filmmaking practice has a place in cultural history and continues to be accessible to its small, dedicated audience,” wrote Amy Taubin in Artforum’s May 2005 issue.